Breath gas analysis is a method for gaining non-invasive information on the clinical state of an individual by monitoring volatile organic compounds (carbon-based chemicals) present in the exhaled breath. Breath gas concentration is related to blood concentrations, feks alcohol in breath and blood..
Endogenous volatile organic compounds (EndoVOCs) are released within the humanorganism as a result of normal metabolic activity or due to pathological disorders includinginflammation and cancer. The VOCs enter the blood stream and are eventually metabolized orexcreted via exhalation, skin emission including swetting (garlic) , urine, etc. The recording of vapour phase spectra for various types of VOCs became a fascinating taskin the late 1990 and beginning of the 2000s. Mainly because the results obtained were in almost all cases not described or known before. These fundamental studies by Lagesson and collaborators resulted in a collection of more than 1400 reference spectra, covering most of the chemical classes. The important knowledge gained was, that about 90 % of the ?max were observed at wavelengths shorter than 200 nm and in addition very informative, especially for groups of compounds not considered as UV absorbing. The opportunity for identification, classification, confirmation and isomeric determination was far reaching and the sensitivity was very high, with absorptivities up to three orders of magnitude larger than for infrared spectrophotometry. Gas chromatography hyphenated with UV spectrophotometry (GC-UV) is a full scan analytical method, where the compounds eluting from a gas chromatographic column are continuously monitored. 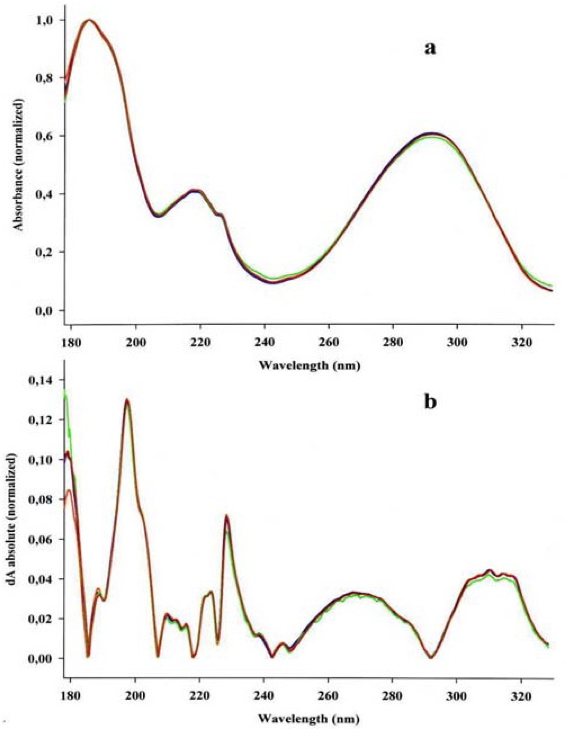 The result from a GC-UV analysis is in three dimensions; wavelength (nm), absorbance (AU) and the gas chromatographic retention time (seconds or minutes). By taking the average of absorbance at certain wavelength intervals a chromatogram is obtained. If this interval is broad it represents a non specific detection and if it is narrow it can represent a specific detection for a certain group of compounds. This is similar to the total ion current (TIC) and the single ion monitoring (SIM) in GC-MS or the Gram Smidt (non specific chromatogram) and certain wavelength ranges, characteristic for functional groups in GC-FTIR. A broad UV wavelength range chromatogram from a petroleum product is shown in Fig. 1. 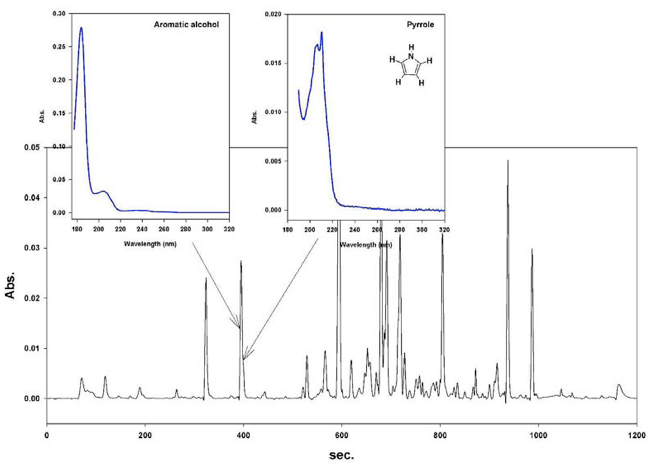 From this figure it is evident, that assigning a compound to a certain peak in the chromatogram is most often impossible or very difficult, when samples containing complex mixtures are analyzed. Higher resolution separation can be used, but these are tedious and most often there are still co-elution situations to handle. Because of the characteristic UV vapour phase spectra for various classes of compounds it is possible to distinguish compounds even if they are co-eluting. Fig. 2 shows such a case. Fig. 2 Mixed spectrum of two co-eluting compounds. Still naphthalene and a non aromatic aldehyde can be distinguished. 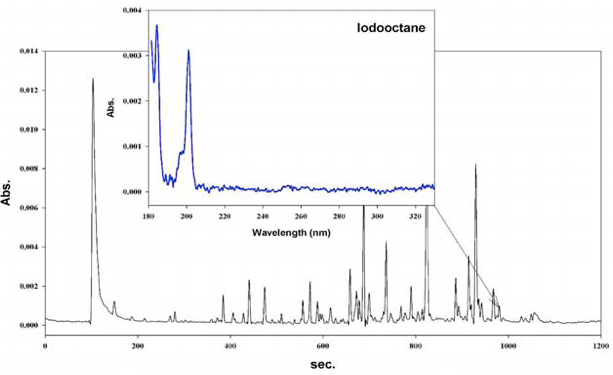 Even if the separation is insufficient so that two components form one chromatographic peek a slight difference in retention time is often enough to obtain two distinct spectra suitable for identification and classification. Fig. 3 shows such a case and the result was achieved after a simple spectral subtraction. Fig. 3 Spectra for identification/classification for insufficiently resolved components in a dust sample. Trace amount of compound can be identified as shown in Fig.4. In this case a GC-MS (EI)analysis was unable to find this compound. GC-UV is based on the UV light absorption in the gas/vapour phase. The wavelength range is extended down into the far-/vacuum-UV. This gives a number of advantages. By carrying out the recording in the vapour phase no spectral shifts, like in the liquid phase, are present and, there are no cut off wavelength limit due to any liquid solvent. At the short UVwavelength range the majority of the qualitative information can be gained. Moreover, this range also most often shows the highest absorptivities (i. e. highest sensitivities) and many classes of chemical compounds, not considered as UV-absorbing, can be determined with high sensitivity. The GC-UV is a general method of analysis and can be applied within numerous application areas. The results obtained are both qualitative and quantitative. The qualitative results give both identification of individual compounds, including isomers and chemical classification of compounds present in the sample. Classification gives comprehensive information about the chemical class as for example an aliphatic ketone or a substituted benzothiazol and so on. Quantitative determination is based on the knowledge of the light absorbing power of the compound and is often carried out using standards with known concentrations. This is the principle (Lambert Beers law) of spectrophotometry and is considered to be one of the most reliable quantification principle. The new instrument consists of UV light source (lam or LED)collimating optics, gas cell and spectrograph equipped with holographic concave grating and CCD photosensitive camera/array. Far UV radiation is absorbed by oxygen and water. Due to this fact the whole optical path is filled and purged with an inert gas (e.g. nitrogen). The gas flow cell (light pipe) is designed for low dead volume with a highly reflective inert internal layer coating. Cell can be heated in the temperature range of 50°C – 300 °C. It is connected to the output of a gas chromatograph via heated quartz capillary. Improvements in comparison with the earlier detectors are first, that a CCD (back thinned) detector is employed. In comparison with the earlier used PDA detectors the CCD detectors have a much better quantum efficiency at shorter wavelengths. It is also considerably more sensitive and faster. Therefore the recordings in the short wavelength range are expected to be substantially more stable resulting in extended range of linearity at short wavelengths. The earlier UV detector models had a temperature limit at about 200 °C. Extending this limit up to 300 ° C will improve the possibility to analyse high boiling components to a considerable extent. Moreover, the extended path length of the light pipe and the considerably reduced dead volume of the cell will certainly improve the sensitivity to a great extent. All together, this will hopefully lead to, that identification/classification of compounds down to the low pg range and detection limits in the high fg range will be possible. Future development might also include a direct deposition technology similar to the one already present for GC-FTIR (www.spectra-analysis.com). Such a development would presumably implies even higher sensitivities and could open up also for HPLC applications. Far/vacuum vapour phase UV spectrophotometry. The reproducibility and the excellent definition of the appearance of spectra is shown in Fig. 5. 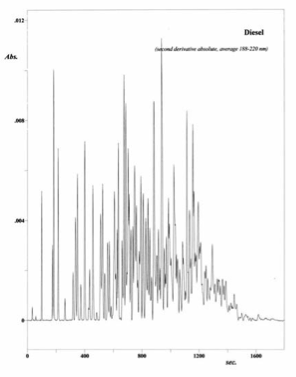 Reference spectra for 4-Nitroaniline was recorded four times during a period of several years. These recordings were made using four different reference samples and at different instrumental parameters. The four spectra received were normalized and plotted in an overlaid mode (Fig. 5a). In order to amplify spectral details the derivative can preferably be used to enhance spectral details (Fig. 5b). 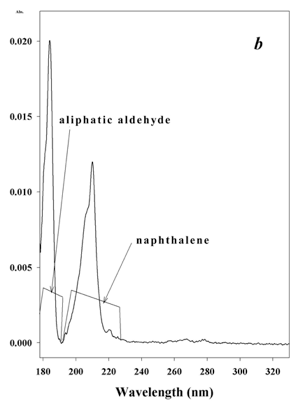 a/ The spectra of 4-Nitroaniline recorded four times, normalized and overlaid.